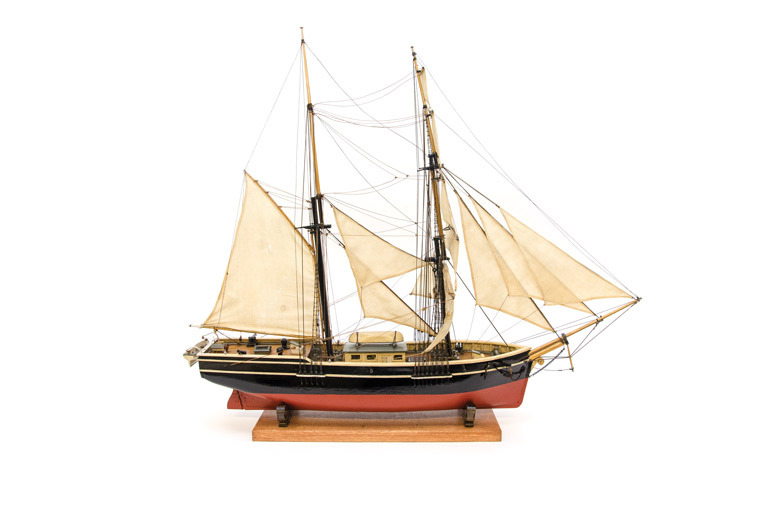 This model was commissioned by the HBC and built by Alan Coburn of Nanaimo, British Columbia, in the 1930s. The schooner Cadboro (sometimes spelled Cadborough) was built in Rye, England, in 1824 for the Hudson’s Bay Company’s Pacific trade. She arrived at Fort Vancouver on May 24, 1827, and was then used to explore the lower coast of California. Aside from her trading activities, the Cadboro went on some interesting adventures. In 1840, the vessel accompanied the SS Beaver to Sitka, Alaska, and later she was chartered by the U.S. Navy to take the crew of the wrecked schooner Shark to California. She carried on with trade until her sale in 1861; the following year she was wrecked in a gale. This model was commissioned by the HBC and built by Alan Coburn of Nanaimo, British Columbia, in the 1930s. Coburn made a number of models for display in the company’s Winnipeg museum. After many years on loan to the Maritime Museum of British Columbia, the models have returned to Winnipeg. They will be displayed in the new upper balcony of the Nonsuch Gallery at the Manitoba Museum in an exhibit celebrating the HBC’s rich nautical history.